Introducing…our new Afternoon enrichment program! Afternoons with little ones can be tough. Nap schedules are unpredictable, it’s difficult to know what to do after a morning of activity, and sometimes you just need a break! Our afternoon program is designed to free up your time and give your child an afternoon of music, art, movement, and science. The program is offered M-Th, 1-5pm. We have two age groups: 18mos-3 yrs, and 3-5yrs. Coworking membership is optional. Enrollment is currently open for our Spring term. Spring term runs January 7-June 7. Schedule a tour to learn more about our program. 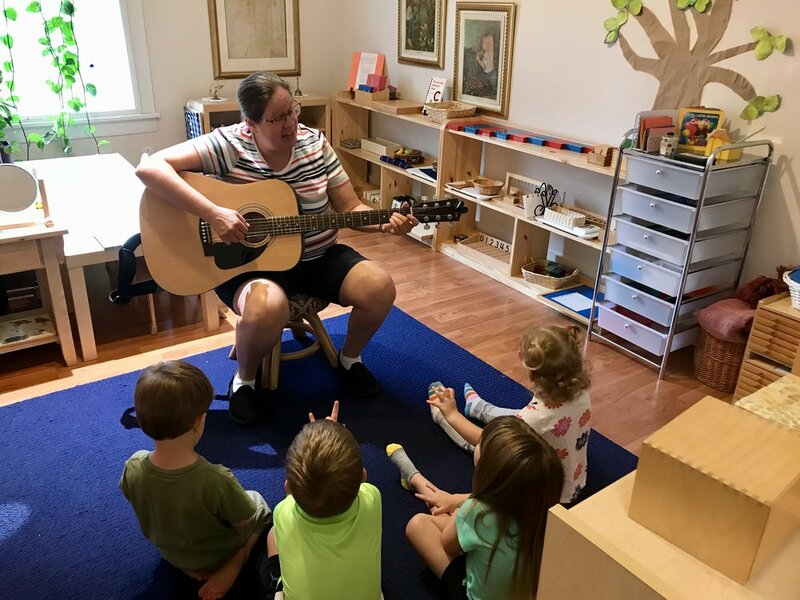 Music time is led by our Children’s House teacher, Jeannene Schnell. Jeannene is a lifelong music maker and former member of the Durham Chorale. Sing a-longs and playful music are not only fun, but they also teach children about rhyming, storytelling, and working together. Tonya leads guided art activities that give your child the chance to learn new skills while exploring their own creative spirit in a supportive environment. Every Tuesday and Thursday, your child will explore new ways to move their body! Tonya brings decades of training in ballet, tap, jazz, & modern dance to this program and infuses it with yoga and mindfulness, so there is always something new to learn. Jeannene takes the children on science explorations - whether it's digging in the garden or taking a walk to the nearby creek, your child will explore science and nature through hands on experience in the world. Each day ends with outdoor play time to get all the wiggles out! 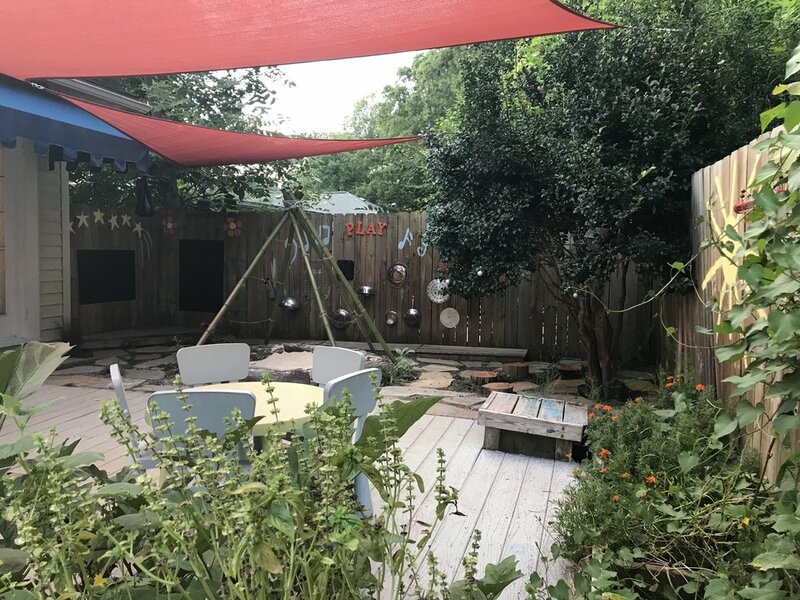 Our outdoor space includes a sandbox, organic garden, music wall, and chalkboard walls. We have loose parts for building ramps and structures. There’s everything your child needs for an imaginative outdoor adventure! Tonya is passionate about the Montessori philosophy and looks forward to meeting each child where they are and giving them opportunities to succeed in meaningful work. She believes that The Montessori method naturally develops a love of learning new stuff and a caring community of strong, independent individuals. Tonya has a BA in Philosophy from a small Liberal Arts college in Michigan and will be continuing her education in Montessori this Fall. In addition to teaching (and learning), she enjoys any opportunity for creativity, music, a good book, and exploring Durham on walks with her pups Franny and Debbie, and husband Josh. Jeannene has been teaching at Nido since we opened in 2015. She has 36 years experience working with toddlers and preschoolers. She received her Montessori primary credential from the Albanesi Education Center in 1997. Since then, she has been dedicated to fostering Montessori environments for the youngest learners. Jeannene takes care to get to know every child and mold the environment to the group's specific needs. This attention to detail is one of the many reasons Jeannene is able to inspire children to do great work in her classroom. She is particularly community-minded, making her a great fit for Nido. She loves getting to know the whole family of each child in her classroom, and she views the parent-teacher relationship as a team working together in the best interest of the child. She uses parents' insights to guide her own interactions with the children in her classroom.